After watching a clip of former child star Raven Symone's now-viral interview with Oprah Winfrey, in which she also addressed her skill of avoiding the common path of the American child star (and many of her contemporaries) and her sexuality, I am compelled to say I do not find any fault with what she said, but simply how she said it. While explaining to Oprah that she is tired of being labeled, she mentioned that she does not want to be called "African American." This blew Oprah's mind, and she noted that twitter would rise to take offense to that comment once the interview aired. While I have yet to see any backlash on twitter, I did just happen to see a "celebrity gossip wrap-up" type of headline which said, in part, "Raven Symone Doesn't Want to be Black" in the title, and that was enough to make my blood boil, because that is not what she said. I write this in the hopes that offering my opinion would help clear things up a bit. First of all, the term "African American" has never made sense to me. Of course, I am considered an "African American woman" by consensus reports and college applications. My parents are both considered "African American" by those same statistical measurements. My mother's parents immigrated to Brooklyn from Jamaica. She was the last of four children, all of whom who were born in the states except for the first. My father's family traces back to South Carolina. Though both of those paths do inevitably trace right back to Africa, I have always preferred to identify as "black." Understandably, "black" may seem basic to those who do not share this perspective with me. In fact, I distinctly remember saying to someone, "I'm not black, I'm brown," while discussing the stupidity of labels in general with some friends in middle school. True. But white people aren't all actually white, either. No one group of people is the same color. So I think looking at this with literalism in that sense leaves us nowhere. To me, the word "black" is packed with more power than the words "African American" could ever hope to contain. Think about it- "Say it loud! I'm African American and proud!" or "African American Power!" just ain't quite the same. On a more serious note, however, "African American" sounds like a euphemism to me. Often when people say it I find it is tinged with hesitation, with a fear of upset, like we're all trying to cover up some horrific, monstrous identity beneath it. It sounds like a country trying to protect itself from the truth of its origins. From the beauty of all the colors that make up its fabrics, and the struggles it has had to go trudge through. All of that exists in the word "black" when I hear it, but not in the term "African American." I don't think we are all African-American any longer. There was indeed a time when every dark skinned man and woman in this country came directly from Africa. But now, hundreds of years after the Atlantic Slave Trade, and the centuries of war and mass migration that followed, our bundle of cultures has rearranged itself based on the climates, geographical barriers, and political and social temperatures of the lands that are now the homes of so many of us. The term is outdated. Now, "African American" implies "sort of native" to this country, even though our ancestors built the whole damn thing from the ground up. Even though they were shipped in because those "founding" Europeans literally could not begin a new nation without their labor. "African American" is infused with its original meaning, which I believe recognizes the American black community as a group that is not a part of the foundation and function of this country; a sub-division of the American people. The descendants of the Europeans who started those first settlements on American soil and completely disturbed everyone in the process are not named after the continent that they left to come here. We do not call every Caucasian man and woman in this country "European-Americans." We call them Americans. Or Caucasians. Or white people. Additionally, I often think of our friends who were actually born and raised in parts of Africa, or those whose parents or grandparents came to the U.S. from an African country in search of jobs or education. I find it hard to believe that those folks could consider those of us that were born and raised in America very African in our cultural practices and identities. Even though our lineages do ultimately trace back to Africa, for the most part, our every day lives, beliefs systems and cultural identities are very much displaced from authentic African cultures. That supposition also discourages me from the security of truly identifying myself as an African American woman. Though I cannot speak for Raven Symone, if her argument aligns with my own, it sounded like she tried to say (and then neglected to explain) that we should stop using a term given to us by the same people who captured and enslaved our ancestors, because it simply no longer fits, and is frankly a slap in the face to each us. Though I completely respect (and for the most part, agree with) her opinions, I am slightly disappointed by the fact that she had the opportunity to enlighten a vast majority of black American people about her thoughts on an important issue- identity -but instead took her knowledge and made-up mind and dangled it over our heads. In that moment, in that chair beside Oprah Winfrey, Raven was a young black woman with something many young anythings will never have- a platform. She had the opportunity to reach millions with what I found to be a rather progressive thought, but instead she opted out of it in favor of a prideful and condescending air of mystery. Oprah even gave her the opportunity to expand, asking her to tell us what she really meant by saying she doesn't want to be called an African American. But she turned it down, opting instead for the simplicity of reiterating her initial answer- "I'm an American, that is what I mean" -to deflect any pursuit of deeper knowledge of another side. And that, while certainly her right, was not a fair choice to make. Again, I can't speak for miss Symone, but when I heard her say those words, my reponse was an overwhelming sense of concurrence. 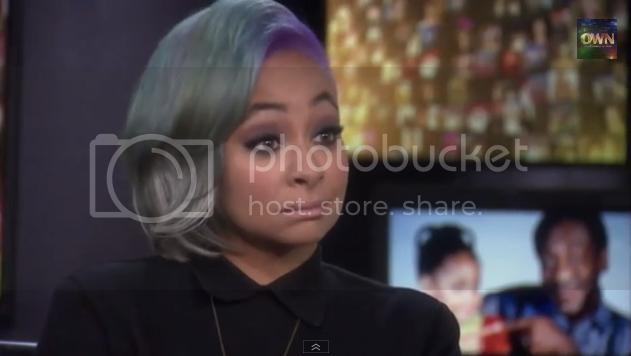 The term "African-American" doesn't sit right with me either, and I'm glad that Raven had the courage to say that in an interview that would reach so many people. I just wish she had also had the courage to share with us the journey that led her to that conclusion.